One thing that operators in this hobby have to be pleased about is this deal Lionel made with manufacturers such as 3rd Rail to use RailSounds and TrainMaster Command Control. In the case of 3rd Rail, which produces primarily brass steam locomotives, which discriminating model railroaders prefer, highly detailed models now have sounds to match. Not all of 3rd Rails locos have the Lionel electronics. The Challengers, the 4-10-2s, and the J-1a and J-1d Hudsons are slated for the Lionel sounds and control system. The J-1a should be a welcome announcement for Hudson buffs. Number 5200 was the first Hudson and the only J-1a. Another locomotive that caught our attention is the streamlined Pacific in Mercury shrouding, which is due later this year. What is unique about this 3rd Rail locomotive is that it will be made in diecast instead of brass. This helped lower the price, which is $550. The Mercury K5 Pacifics were the first streamlined locomotives Henry Dreyfuss designed for the New York Central. Two were produced in 1936 and lightly resembled the Commodore Vanderbilt Hudson, which was the first streamlined steam locomotive in America. The Mercury's most memorable feature was the illuminated drivers. 3rd Rail has also announced plans to produce a set of matching passenger cars to complete the "train of tomorrow." The observation car of the Mercury had distinctive long windows around the back to enhance the passenger's view. Atlas O has recently announced plans to produce SW switchers in different roadnames than their first run. The first run had sounds by Dallee Electronics and were either SW8s or SW9s. These new switchers also include SW900s, SW900Ms, and SW1200s. These locomotives will retail for $349.95. A Raritan River SW900 model is a limited edition piece and will retail for $359.95. These switchers will include Lionel RailSounds and TrainMaster Command Control. If we remember correctly, the switchers produced four years ago were retailing for $300.00. So one is only paying an additional $50.00 for the Lionel features this time around. Atlas steel version of their 21st Century Track System has been available for some time now. They have some very large scale freight cars available as well. At casual glance, one would think they were G scale cars if it weren't for the O gauge trucks on them. In spite of the transition Lionel is going through right now, most of which is behind them, products are being delivered regularly. The 38 Pumping Water Tower was just released. We haven't tested ours yet but we hear it is actually noisier than the original. Many LionMaster products are shipping. A new catalog is due very soon. We will report on it on this page when we get a copy. Earlier in the year, Lionel forged a deal with QSI Industries, licensing several QSI patents. On July 26, Lionel announced the acquisition of an electronics company specializing in O gauge train control systems. Here is the press release. Marx produced a new line of trolleys late last year. They have recently added matching non-powered versions which are available either separately or with matching powered units. Also new are a set of freight cars in classic Marlines decoration. A Marlines steam locomotive was already produced and is still available to complete the set. 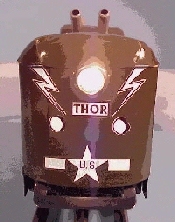 A new motorized unit, called The Thor, is in pre-production now. It is a military-themed powered car with guns on the roof. By the way, Marx Trains are produced in the United States. According to president Jim Flynn, they have no intentions of moving production offshore. We've been hearing mixed feedback about MTH's new locomotives. One collector we talked to raves about the new sounds. Others are having a tough time with the new control systems. At Christmas time last year MTH sent a letter out to dealers expressing the need for everyone to take the time to familiarize themselves with the new system. There are some components to the new system that have yet to be produced. Namely the Digital Command System units. According to their website, these are scheduled to ship on August 15 of this year. MTH has also downsized. We've read the number of employees layed off to be 25, but we've heard the number to be 40. Currently, MTH employs about 70 persons. QSI Industries publicly announced a lawsuit it has brought against MTH. The suit centers on what QSI believes are eight infringements of four patents in MTH's new locomotives with Protosounds 2.0. Click here for the QSI letter on the situation. The new smoke units are a big hit. Instead of the usual steady pour of smoke (which still occurs in neutral), the fan is synched with the chugging sound so the smoke pours out in spurts, very much like puffs. MTH has been "dirtying up" their drive rods instead of going with the customary shiny plated look. Also, the rims on drivers are now black. This looks more prototypical on most steam engines but in the case of the Dreyfuss Hudson, this is incorrect and makes the otherwise silver drivers look smaller. MTH recently released a whopping 100-page catalog. The spine is as thick as Gentleman's Quarterly magazine, the main difference is that the MTH catalog doesn't have a bunch of fashion ads in it. The catalog has five main categories: Premier, RailKing, Tinplate Traditions, Garden Scale, and Rugged Rails. Everyone is familiar with the first three sections. Garden Scale is MTH's new line of 1 gauge trains, which are often used for outdoor "garden" railroads. The Rugged Rails is an off-shoot of the RailKing line. This line is made up of freight rolling stock, each item retails for $24.95. Finally, MTH has recently announced four different scale Hudson sets available to their Railroaders Club members. Three sets are reproductions of classic Lionel prewar Hudson sets: the Railchief set, called the Streamline Super-train; a work-train headed by a gunmetal gray scale Hudson (as opposed to a semi-scale Hudson) and tinplate Vanderbilt tender; and the same gray locomotive and tender pulling the Blue Comet cars. 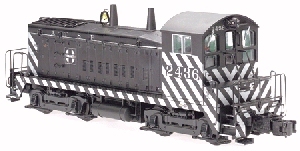 The fourth train is a black scale Hudson pulling modern detailed freight cars. Each set will sell for $1,295.00. A $200 deposit is required when ordering, which is done directly through MTH. 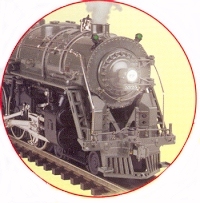 Like 3rd Rail, Weaver Models is renown for high-quality brass scale locomotives. And like 3rd Rail, Weaver is getting into diecast scale locomotive production. The Baldwin 2-8-0 Consolidation is their second diecast steam locomotive. The price for the 3-rail version with Lionel electronic features is $595. Weaver is also developing a new set of passenger cars. They will be scale versions of the commuter cars like the ones that Gilbert American Flyer made in S gauge. 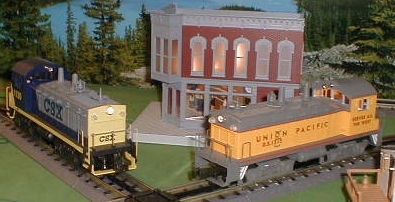 One of eight decorated Consolidation locomotives made in diecast by Weaver Models. Over the past couple years, this hobby has seen the development of highly-detailed cabooses. Weaver has just joined the fray with their Northeastern Caboose line. Each model has detailed interiors, figure, constant lighting and clear windows. To top it off, they aren't raising the prices. Weaver also has a considerable amount of its product line made in the United States. Over the course of the last year, Williams has come out with some great toy train reproductions. Some wonder if there is a market for toy trains as opposed to the modern scale models. We certainly think there is. After all, there are kids these days aren't there? What is particularly attractive about the Williams pieces are the quality and prices. For instance, there is the reproduction of the 671 Turbine. Lionel has produced the 671, 681, 682, 8404 (prototypically numbered 6200) and the Century Club versions, which are the style Williams has copied. Everyone of the Lionel versions command at least $300 to $600 in used condition. A lot of that probably has to do with the collectible nature of Lionel items. The Williams version is $250.00. It comes with a simple whistle and smoke unit, and it'll pull like nothing else. The one thing that looks a little funny about the Williams Turbine is the Flywheel almost poking out of the cab. It's blackened, but if you are comparing it aesthetically to the Lionel versions, that's the first thing you'll notice. Interestingly, Williams has copied the Fundimension's 6-wheel diecast truck instead of the postwar version, which was plastic but it can (and has) been made in diecast. Williams NW2s turned out to be another home-run. Again, the price was irresistible: $180.00 but you can find them for less than $150.00. They come with powerful dual motors and very nice paint jobs. Diesels painted to look like original Lionel postwar models match very closely. The switchers decorated with new roadnames also have the handrails and grab irons painted, along with and EMD builders plate on the chassis. One thing we particularly like about the Williams switchers is the complete postwar detail on the cabs. In 1970, Lionel altered (apparently permanently) the cabs so the the panel detail was eliminated to make graphics application easier. This alteration was unfortunate, and the lack of detail exists even on the five high-end NW2s made starting with the Western Maryland model from 1989. Williams now uses a unique sound system for their trains. Called "True-Blast," a single touch of the whistle button activates a programmed series of whistle or horn blasts. On the NW2s, a clanging bell is heard for several seconds and automatically shuts off. Future Williams reproductions include the Norfolk & Western J in postwar colors. There's just something about that red and yellow stripe that we like. Obviously, Williams plans on making the long-stripe version of the tender. They also plan to make the postwar version of the GE 44-ton switcher (no handrails, GM Blomberg trucks).